Sapphire presents the GearBox Thunderbolt 3 external graphics card solution to boost the performance of notebooks and mini-PCs by upgrading the GPU and other PCIe devices using the ultra-fast Thunderbolt 3 interface. The Thunderbolt 3 (USB-C) port connects the external graphics card with a 40Gbps connection. The Sapphire GearBox supports PCIe x16 interface graphics cards, up to dual PCIe slot GPUs which includes the Sapphire NITRO+ and Sapphire PULSE Series Radeon graphics cards. 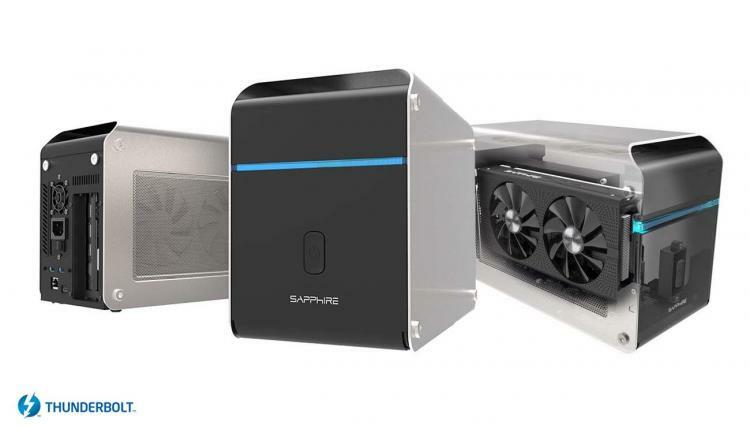 The Sapphire GearBox packs a robust and efficient 500W internal power supply to support high-performance graphics cards or other PCIe devices such as NVMe solid-state drives. The Sapphire GearBox also offers additional USB 3.0 outputs for other devices such as external drives. It also packs a dedicated Ethernet port for fast wired connection. Thunderbolt 3 is the most advanced connecting interface through USB-C delivering speeds of up to 40 Gbps. It offers improved performance with dual 4K Displays and additional features with a single connecting interface. The SAPPHIRE GearBox provides a seamless way to upgrade your computer’s performance via Thunderbolt 3. Learn more about the Sapphire GearBox eGFX Solution here.